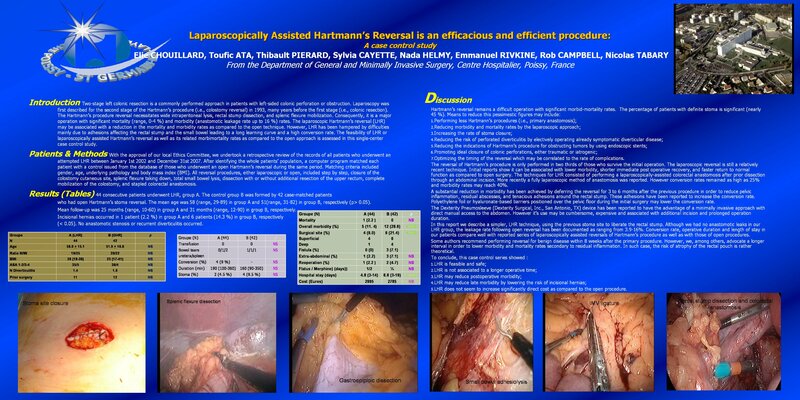 Background: laparoscopy may lower the mortality and morbidity rates of Hartmann’s procedure reversal. However, it remains difficult mainly due to adhesions of the small bowel and the rectal stump. Methods: Retrospective review of the charts of 44 patients who had laparoscopic hand-assisted Hartmann’s reversal (Group A) between 2000 and 2007. On a case-control basis, these patients were compared to 42 patients (Group B) who had open Hratmann’s reversal during the same period.